The universe was darkest black but also brightest white and full of singing. The sound carried forever, it was endless. It burned on and on after the first note rang for centuries afterwards. In the cosmos there was birth and death and being and is. The singers didn't sing in what we know as words, they sang with their light, always burning; ephemeral- like mist, acid, water, or fire. Elemental, raw, and pure. Pure in the way nature is, with brutality laced fierceness. All the stars know is simply everything. Every star that sings, they hear and they know. Every one that stops, is dead or lost. But they will join the chorus for as long as they possibley can. A glowing white ball of fire was caught in the fight against the darkness and the cold. It ached but still sang on as the black pressed in and brought it's bitter chill closer and closer to it's heart. This burning ember did not want to die out. When the black strands of death choked out it's light it yet refused to bow out gracefully. When the darkness won the star itself folded in upon itself and crumbled, imploded, drifted into the abyss. The soul of such brightness found itself loose in the heavens speeding towards an unknown warmth, a call that it must answer, an urging that it only knew was not death, not yet. When once the world stopped spinning it was awake. It had always been awake before, stars never sleep, but it was a different kind of awake. It -the star- was different, it 'was', but it wasn't what it 'was'. Words had had no meaning before but suddenly they came pouring into this new mind. Words, thoughts, layers of consciousness, and the star met with darkness. It was not a final darkness though, not the one that had come for it before, it was just one of many smaller kinds, what is called sleep. There was also a body now, it had a 'body', limbs, torso and a head. It spent a long time working on the words in it's new mind, saying them aloud, playing with the sounds and then singing them, which was not the same as it once was. He couldn't hear the voices anymore but somehow he knew they were not dead. He could see them once the sun went down and the thing called night challenged the light. The night did not scare him, he had always been surrounded by the void, and this was touched with colors and far away, his home. He didn't know where he was but that had never much mattered. It was green, there was grass, there were some trees and a brook with a waterfall. Even knowing the words was a wonder, the way they appeared in his mind, the sound they made when he said them aloud, having an 'aloud' and hearing. There were sights, sounds, taste and touch, all of these were new and novel things. It was quiet and he was alone. He listened very hard for the stars and thought he could hear them, just barely. It was different now, these things had always just 'been' before. He tried to sing back. He wondered if they could hear him and wondered again at wondering that. For never before had that thought existed. The stars always sang and always heard. They hear me, he nodded to himself. He was beautiful and he knew it. The most beautiful thing on that world. On all the worlds. For a while he was the only thing on that world. (Or so he thought.) Then one day he saw other creatures. He was far away from where he had started his journey but he kept his distance. They ignored him. The creatures he met were animals, when he met more intelligent creatures, like himself, he was not overly impressed. They were not as bright and shiny as he was. 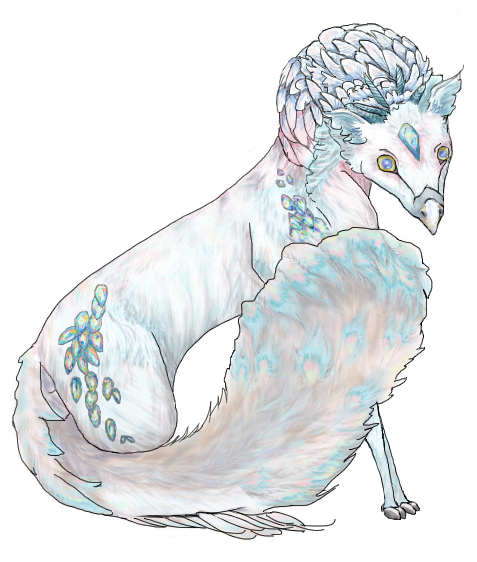 He had shimmery silvery white fur, white iridescent feathers that glimmered pink, blue, and pale gold. 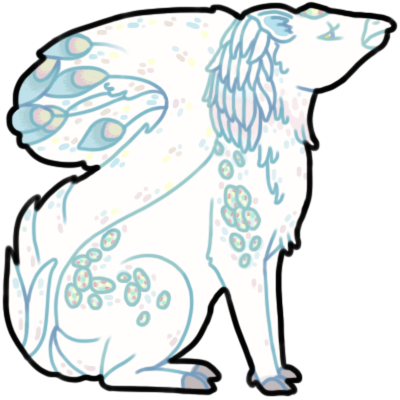 He had a mane of feathers and opals on his flanks that flashed brilliantly in the sunlight and caught the moon at night. He had never met another creature that looked like him. I'm the only one in existence', he thought. Every night he sang to the stars before he went to sleep. He didn't know where he was going on this planet but he wanted the stars to know that he was still there, with them. He 'was'. He was not unhappy, he was introspective and alert, always observing the world and assigning the things he saw value. None as high as himself. For now he was just wandering, exploring everything around him, simply..becoming. You will always have a piece of my heart Fred. 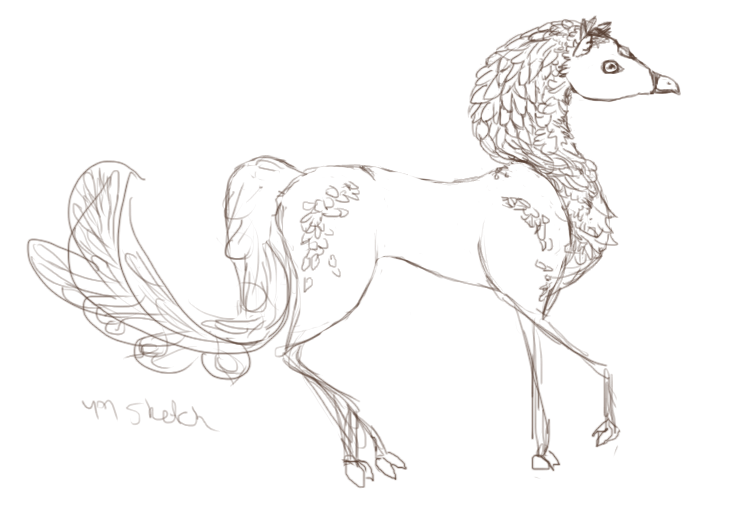 Thanks to PRONGS for letting me adopt this fab species and re-name.